This project uses a TCS230 color sensor I ordered from Amazon. It uses both "passive" and "active" color recognition: Passive recognition goes straight to an RGB LED. 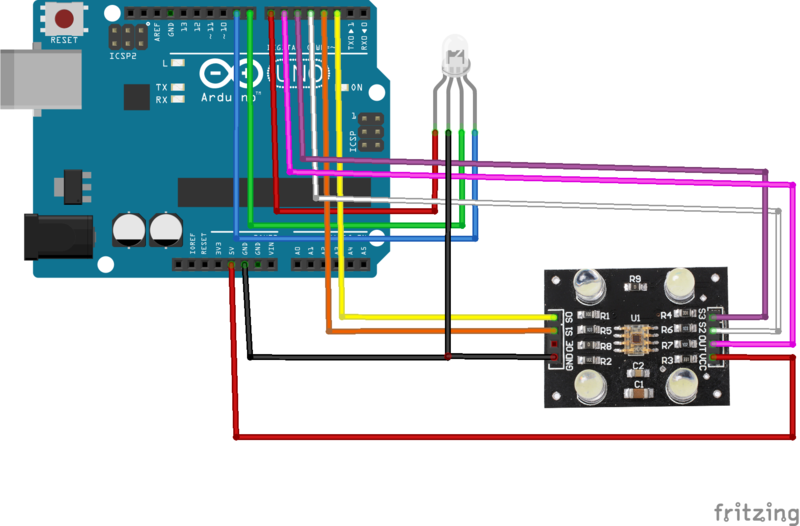 Active recognition is processed by the Arduino to output a specific color. In the TCS3200, the light-to-frequency converter reads an 8 × 8 array of photodiodes. Sixteen photodiodes have blue filters, 16 photodiodes have green filters, 16 photodiodes have red filters, and 16 photodiodes are clear with no filters. The four types (colors) of photodiodes are interdigitated to minimize the effect of non-uniformity of incident irradiance. All photodiodes of the same color are connected in parallel. Pins S2 and S3 are used to select which group of photodiodes (red, green, blue, clear) are active. For example, you may need to change redColor > 250 to redColor > 230 and so on. However, this part of the code is only used for "active" color detection (as opposed to passive), so you may comment it out entirely if you want to. Wait for the serial monitor to say "next"
Wait for the serial monitor to say "done calibrating"